The National Mississippi River Museum & Aquarium is an outgrowth of the Dubuque County Historical Society (DCHS). 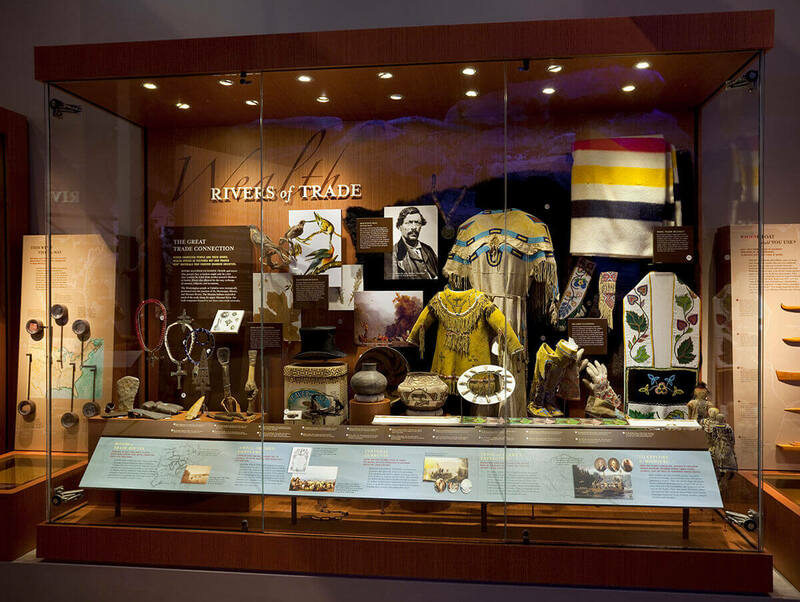 As such, the DCHS mission and Museum & Aquarium mission are one in the same – to inspire stewardship by creating educational experiences where history and rivers come alive. Traveling on water was the quickest and most common mode of transportation for early Native Americans. Canoes made of bark were fairly easy boats to build, they were fast, and they could haul heavy loads, yet were still light enough to be carried by one man when portaging. 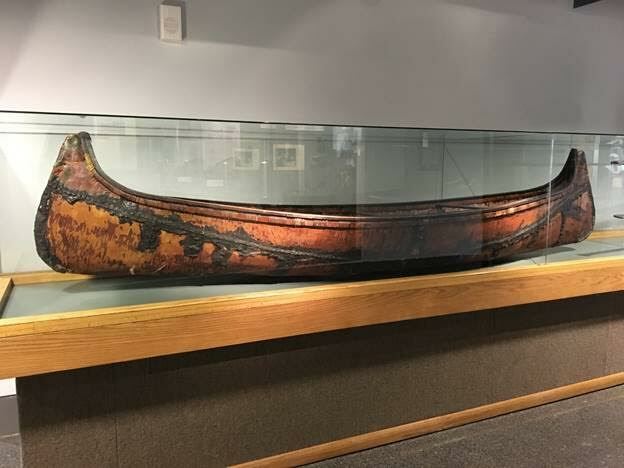 The materials used in building a birch bark canoe included not only bark from the birch tree, but also spruce root, cedar planks, and pine pitch for sealing the seams. The story of the Dubuque County Historical Society (DCHS) has its roots in the Richard Herrmann Museum of Natural History, established in the 1870s. DCHS formally organized in 1950 as a private, non-profit organization in the state of Iowa. In its first years, DCHS presented programs and collected oral histories, archives and photographs. Activities undertaken by DCHS included historic preservation awards, walking tours, National register nominations, and providing step-on bus guide service. DCHS helped restore the Shot Tower and waged unpopular battles to block proposed demolition of architectural treasures, including the Dubuque County Courthouse. DCHS opened its first museum, the Mathias Ham House, with support of volunteers, a public radio campaign through KDTH, and a long-term lease from the City of Dubuque. Harry Slichter, retired Telegraph Herald editor, wrote guest articles in the TH, pleading for artifacts. In answer to the requests for artifacts, hundreds of boxes were donated from the Richard Herrmann Museum of Natural History, including fossils, Native American artifacts, fur trade goods, lead-mining artifacts, and Julien Dubuque’s cradle. Among the donations were the remains of Meskwaki Indians Peosta and Potosi, who were subsequently re-interred. DCHS awards its first historic preservation awards and begins a long-standing tradition. The idea of a riverboat museum was proposed at a DCHS board meeting by Wayne Norman and accepted by the DCHS with the caveat that the organization would not incur any long-term debt. In December, Captains Robert and Ruth Kehl donated the Burlington Northern Freight House, a 10,000-square-foot waterfront building at the Ice Harbor. At Bill Woodward’s urging, the Woodward Foundation made a challenge pledge gift of $200,000 to build the Fred W. Woodward Riverboat Museum. Wayne Norman applied to the National Trust for Historic Preservation for money to restore the freight house. DCHS received $135,000, the seventh largest award in the country, and the largest on the inland waters. DCHS kickoff off a $650,000 fund drive after already amassing $385,000 toward the goal. In September, the William M. Black stream dredge boat arrived as part of the federal government Surplus Property program. Too wide to fit through the floodwalls, Newt Marine cut off the side decking, to be reattached later. The fund drive raised $1.1 million. The William M. Black opened to the public. The Fred W. Woodward Riverboat Museum building opened. National Rivers Hall of Fame opened. The museum is accredited by the American Alliance of Museums. William “Bill” Woodward, former president of the DCHS, passed and left the organization nearly $2 million. This gift served as a catalyst for the museum’s America’s River campaign. After combining forces with the city and chamber, the America’s River Campaign began with a plan to re-envision the Port. The campaign began with a goal of $25 million and increased to $30 million thereafter. Vision Iowa, a fund of $200 million, is initiated by Iowa Gov. Tom Vilsack and passed by the Iowa Legislature. America’s River campaign submits their application for funding. Dubuque receives a Vision Iowa award of $40 million, with just over half going toward the river museum project. By the end of America’s River Project, Vision Iowa, the city of Dubuque, Dubuque County and private donors provided $188 million. It was the largest fundraising campaign in Dubuque history and culminated with the opening of the William Woodward Mississippi River Discovery Center, a new city Riverwalk, and the Grand River Center. The institution becomes the National Mississippi River Museum & Aquarium. Peninsula Gaming, the one-time owner of the Diamond Jo Casino, donated its Portside building to the museum along with a $3 million gift. The Museum & Aquarium spearheaded America’s River II. The Diamond Jo National River Center building opened. As it celebrated its 10th year, the National Mississippi River Museum & Aquarium welcomed its 2 millionth guest. The National Mississippi River Museum & Aquarium is now the leading cultural and environmental facility in the region and the largest tourism attraction in a 150 mile radius. The National Mississippi River Museum & Aquarium is a Smithsonian Affiliate and accredited by the American Alliance of Museum (AAM) and the Association of Zoos & Aquariums (AZA). It is one of only 16 institutions nationwide to be accredited by both AZA and AAM.